The US will head to the polls on November 6 for the Congressional midterm elections. Up for grabs are one-third of the Senate and every seat in the House of Representatives, the two chambers making up congress. Polls are showing the Democrats have a good chance of taking the House, but Senate looks likely to remain in Republican control, and in a final push to keep the House with the GOP, President Donald Trump has hit the campaign trail with a vengeance. Donald Trump warned the crowd that a victory for Stacey Abrams, the Democrat candidate, will have “Georgia turn into Venezuela”. The American firebrand said: “She wants to raise your income tax very substantially, she wants to raise your property tax very substantially. The US President said the final days before Tuesday’s midterm elections remind him of the days before his 2016 win. Donald Trump is attending his first rally of the day, in Georgia. Speaking about the confirmation of Brett Kavanaugh as judge of the Supreme Court, Mr Trump said he was “treated badly”. Daniel Dale, Washington correspondent for the Toronto Star, wrote on Twitter: “Big cheers for the confirmation of Brett Kavanaugh. “‘Boy did he get treated badly,’ Trump says. The CNN reported after Mr Trump’s words on Mr Kavanaugh, the crowd broke out in “lock her up” chants addressed to Dr Ford. Mr Kavanaugh has been accused of sexual assault by Dr Blasey Ford and two more people. The US president’s eldest son will campaign in West Virginia, Kentucky, North Carolina, South Carolina and New York on Monday, boosting six House candidates and Patrick Morrisey, the party’s nominee in the West Virginia Senate race. This move will come one day before the midterm elections take place. Massachusetts Democratic Senator Elizabeth Warren made the claim while replying a question asked by reporters in Worcester, Massachussets. Speaking about Mr Trump’s harsh stance agains the migrant caravan, which sees thousands of migrants travelling across Central America to reach the US southern border, Ms Warren said: “What Donald Trump wants to do is see if he can turn us against each other. Mr Trump said it was a “great honour” to have such a high approval rating among African Americans. The US president is unlikely to “accept personal responsibility” for any losses in the midterm elections, foreign politics expert Adam Hug told Express.co.uk. Democrats are still leading the race for the House of Representatives, an election-eve poll by NBC News/Wall Street Journal has revealed. According to CNN meteorologist Allison Chinchar, the forecast is leaning towards severe weather in key states the day before as well as during the midterm election day. This includes the potential for tornadoes as well as damaging winds in Tennessee and Indiana on Monday. This could push to the east throughout Election Day. On election day (Tuesday, November 6), weather expert Ms Chinchar said southern states on the eastern US coast could see severe storms and potentially localized flooding in some areas. President Donald Trump has left the White House today and is on his way to events in Georgia and Tennessee. There the President will be looking to boost Georgia Republican Secretary of State Brian Kemp’s midterm bid, as well as that of Tennessee Republican candidate Marsha Blackburn. Trump stopped to talk to reporters before he boarded Marine One and seemed to indicate that he felt better about his party’s chances of retaining control of the Senate than the House. The President spoke to reporters before boarding Marine One: ”I think we’re going to do very well in the Senate,” he said. “I think we’re going to do well in the House. According to a YouGov poll of 1,000 people taken across November 3 – 4.42 percent approved of the President. This comes as polling site FiveThirtyEight today say that the Democrats have an 84.5 percent chance of winning control in the House of Representatives. When it comes to the race for the Senate, Republicans have an 84.7 percent chance of maintaining control. Georgia Secretary of State Brian Kemp, the Republican candidate in Tuesday’s election, has opened a probe of the state Democratic Party. This over what his office alleged today was a failed attempt to hack voter registration systems. Kemp’s office, which supervises elections in Georgia, has so far given no evidence publicly for launching the investigation just two days before voters go to the polls. The race between Kemp and Democrat candidate Stacey Abrams, who is vying to become the nation’s first black female governor, has become a flashpoint for allegations of voter suppression. Kemp’s office said in a statement today it opened the investigation late on Saturday and the Department of Homeland Security (DHS) and the FBI were notified. In 2016, Kemp alleged that a federal agency had tried to breach the state’s voting system. 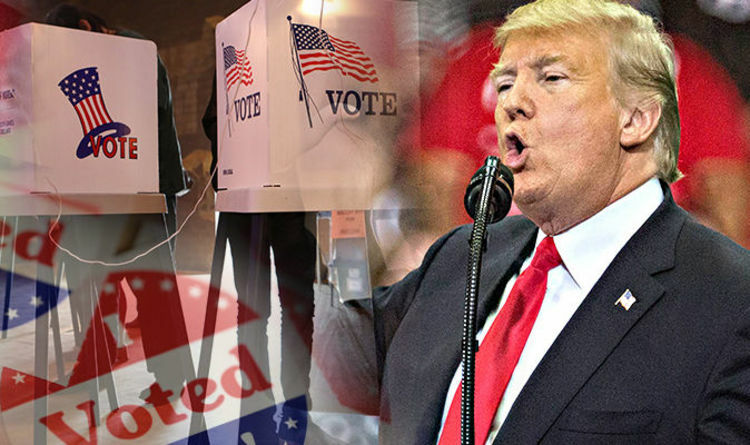 U.S. President Donald Trump has warned that one of his favourite measures of success, the stock market, is in danger if voters favor Democrats in the congressional elections. While not fully accurate – stocks do tend to rise regardless of who controls the government – it does bear out that the market has delivered a slightly stronger performance on average when Republicans dominate in Washington. President Donald Trump’s campaign announced today that he would be joined by “God Bless the USA” singer Lee Greenwood at a rally in Tennessee on Sunday and then again in Missouri on Monday evening. Trump is nearly always brought on stage to the song in his rallies, waiting for the song to finish before he begins to speak. 4.50pm update: What are the parties focused on? The race for House of Representative control is a closely run one between the Democrats and Republicans. In the midterm elections the Democrats are focused on protecting a 2010 healthcare law. Meanwhile President Donald Trump has touted economic growth and sounded dire warnings on immigration to gain votes for his party. The Democrats are leading the Republicans by seven percentage points, 50 percent to 43 percent, an election-eve poll by NBC News/Wall Street Journal has revealed. But the figures are slightly down on the nine percentage lead the Democrats had last month. President Trump has described the first wave of barbed wire barricades put up along the US-Mexican border as “beautiful”. US troops have so far installed the razor-sharp wire blockades along 170 miles of the banks of the Rio Grande River. Mr Trump told supporters at his campaign rally in Montana: “We have our military on the border. The US president also used his speech to once more condemn the caravan of migrants travelling towards the US border. He said: “These are bad people. Bad hombres. The numbers listed came from a Department of Homeland Security report, which states 270 of the travelling migrants have committed crimes including sexual assault and robbery. Early voting indications suggest young people could help swing Congress towards the Democrats on Tuesday. But Angela Wilson, professor of politics at the University of Manchester, told Express.co.uk: “It really depends on where the young people are located. She said: “If the young people are in traditionally blue states which already lean towards Democratic candidates, it may bolster the numbers but not necessarily alter the expected outcome. 1.18pm update: What are the latest polling forecasts? The number of Hispanic voters casting their ballot in November’s midterm elections could be up by a third on the 2014 midterms, with their turnout higher than the overall surge in voting across all US adults, a national tracking poll out today shows. A Reuters/Ipsos poll, taken between September 1 and October 29, found 36 percent of Hispanic voters said they were “certain” to vote, up from 27 percent in 2014. The increase is nearly double the five percentage rise among all US voters over the same period, according to the data. And those same voters are twice as likely to back the Democrat party. 11.15am update: What time do polling stations open on November 6? Polling stations across the United States will open for voting on Tuesday, November 6. But times will vary according to each individual state. Find out what time you can vote in the midterm elections 2018 depending on where you live. Both campaigns for the candidates running for the governor of Georgia have condemned a racist and anti-Semitic recording sent to residents in the state days before the election. The campaign for Democratic nominee Stacey Abrams, who is hoping to become the first US black governor, denounced the calls as evidence of the “increasing desperation” of the Republican campaign. Similar racists calls were sent out in Florida in August to undermine Democrat candidate Andrew Gillum, who is black. President Trump hardened his stance on immigration at his rally in Montana, accusing the Democrats of encouraging endless numbers of migrants to the US. The US president was in Montana to boost the campaign of Republican candidate Matt Rosendale who is challenging Democrat Jon Tester in the Senate. He also claimed “America is booming” while talking about the economy while standing in an airfield in front of Air Force One. Near the end of September and the beginning of October, Twitter deleted over 10,000 accounts that were trying to discourage people from voting. The Democrats flagged multiple messages that were pretending to be Democrats that were trying to convince other Democrats to not vote. This has been a part of a partnership that the Democrats have with several partners that are trying to hold social media organisation to account and stop the spread of misinformation. According to ghostwriter Tony Schwartz who wrote Trump’s famous book “The Art of the Deal”, Trump is panicking as the midterms get closer to elections day. Mr Schwarts says that Trump will “throw anything against the wall in a feeling of desperation” to make sure that the Republicans do not lose the elections. He added that what Trump “realises is this could turn very, very dark for him” and he could potentially lose both the House and the Senate despite polling saying that Republicans will hold the Senate. The Pentagon has said that they will not approve Trump’s request to send at least 5,000 active-duty troops to the US border. They said that it should be handled by local or state law enforcement and did not approve the use of live-fire weapons. Trump has repeatedly said that he will send anywhere from 5,000 to 15,000 troops to the border. He has also labelled the 3,000 migrants heading to the border as an “invasion”. A doctor is apprently treating a women taken ill in the crowd. Trump tells the media to pan their camera s and show the crowd during the Florida rally. He said: “They never show the crowd”. A number of camera operators do this, including One America News. Donald Trump is ready for a speech at Pensacola International Airport in his second rally today. Joining him in Florida is Vice President Mike Pence, Governor hopeful Ron DeSantis and Senate candidate Rick Scott. Trump tweeted: “Amazing lines of people wanting to get in – what a crowd! President Donald Trump has taken to Twitter to announce his arrival in Montana ahead of his rally in three hours time. In his tweet the President also boasted about how long queues were to attend the event in comparison to his predecessor, Barack Obama. 6.24pm update: What is a ‘Blue Wave’? Both parties in the Midterm elections are also known by their party colours. The Democrats are blue and Donald Trump’s party the Republicans, red. There have been talks of a ‘blue wave’, which means that the Democrats would seize control by gaining 218 or more seats in the House of Representatives. In a similar notion, a Red Wave would be the Republicans maintaining majority in the House. 3.55pm: How popular is Trump? President Trump’s approval rating remains low, according to the latest YouGov poll out today. Mr Trump’s disapproval rating stands at 53 percent, while his approval waiting is 42.1 percent. The YouGov poll, listed on website Five Thirty Eight, was taken between November 1 and 3. Washington is to reintroduce all the sanctions it removed from Iran under the 2015 nuclear deal – with the move to come into effect the day before the midterm elections. Eight countries have been granted waivers to allow them to keep temporarily buying oil from Iran. Iran’s leader Ayatollah Ali Khamenei today reataliated against the Trump administration, saying: “The world opposes every decision made by Trump,” as quoted by Iranian state television. Britain, the EU, Germany and Grane have all criticised the move made by the US on Friday. President Trump will be out canvassing support for the Republican party again today, this time heading to Montana and Florida. President Trump has backtracked on comments he made that US troops would be free to fire on migrants who hurl rocks at them while trying to cross the US border. Mr Trump’s new remarks, referencing the caravan of migrants on route to the United States from Central America, come after human rights groups’ condemned his suggestion on Thursday that the military should “consider it a rifle” if rocks were thrown at them. He told reporters outside the White House yesterday: “They won’t have to fire. What I don’t want is I don’t want these people throwing rocks. The Republicans could win more seats in the Senate – as long as the party’s voters are out in force. That is the view of chairman of Republican Overseas Scotland Drew Liquerman, who told Express.co.uk a strong turnout from Republican voters was key. He said: “This race in the House and the Senate is going to be so close and what it’s going to depend on, right now, it’s all going to depend on voter turnout. However, the GOP campaigner acknowledged the House was a far tougher battle for the Republicans. He said: “Right now I think, if Republicans get out to vote, turnout is very strong, I think Republicans can hold the House. Consistent polling has indicated the Democrats are likely to seize control of the House on November 6. 9.30am update: What are the latest polls? Here are the latest forecasts from polling website FiveThirty Eight as of 5.30am BST. Hollywood A-listers Leonardo DiCaprio, 43, and Brad Pitt, 54, are the latest celebrities calling on people to vote in the midterms. The stars of the new Quentin Tarantino film, Once Upon A Time, posted a video to environmental campaigner DiCaprio’s Instagram page on Friday. DiCaprio said: “The future of our country will be decided this week. Elections don’t just matter when voting for president. Pitt, who said the midterms were as imporant as the presidential elections, added: “These issues will be decided from the House of Representatives, to the Senate, to dozens of governor races. The two actors are the latest celebrities to speak out publicly about voting. A live-stream telethon featuring more than 50 actors, YouTubers and comedians will air on Tuesday in a bid to encourage young people to vote. 4:40am update: Can Republicans pull off a win? While Democrats are expected to retake the House of Representatives, it is still possible for the Republicans to maintain a majority. Prior to the election, the Republicans were able to redraw district lines in a move called gerrymandering. This means that the Republicans were able to reshape districts in a way that could allow them to maintain a majority in more counties and ultimately keep their majority in the House. In the final few days before the midterm elections, many young people are saying that they do not want to vote. Some of these people have said that they do not have an ID that their state accepts as identification while others are saying that it is too much work. Others are also saying that they do not see the importance of voting and some say that they will just do it in 2020. During an interview with Vanity Fair, Trump’s former lawyer called black people “stupid”. Mr Cohen said: “I told Trump that the rally looked vanilla on television. During his speech in Indianapolis, Trump commented on the size of former President Barack Obama’s crowd size. He said: “Barack Obama. I watched him speak today. Trump said this while speaking in a high school gymnasium. During a rally in Indianapolis, Indiana, a man in the crowd stole the show from Trump. While he was speaking, people watching the rally online or on the television could see a man “dabbing” throughout the speech. Barack Obama has been campaigning in support of Democratic candidates and has warned against inciting fear while President Donald Trump hammered a hardline anti-immigration message to energise Republicans. The former president hit on a common theme of Democratic campaigns – defending the 2010 healthcare law that was his signature domestic achievement, while urging Americans not to embrace hostility and division in politics. Obama said in Miami: “We have seen repeated attempts to divide us with rhetoric designed to make us angry and make us fearful. “This election will decide whether we build on the extraordinary prosperity that we’ve unleashed … or whether we let the radical Democrats take a giant wrecking ball to America and to our future,” Trump said in West Virginia. Opinion polls and non-partisan forecasters generally show Democrats as having strong chances of winning 23 additional seats and taking a majority in the House of Representatives, which they could use to launch investigations into Trump’s administration and block his legislative agenda. Hollywood’s A-listers are urging young people to vote in this Tuesday’s midterm elections. More than 50 actors, comedians, and YouTube stars will join a two-hour, live-streamed telethon on Monday night aimed at firing up younger voters – the age group least likely to cast a ballot. During the ‘Telethon for America’, celerities will urge viewers to call in to a celebrity phone bank and pledge to vote the next day. A Reuters/IPSOS poll found in October, only 25 percent of people aged 18-29 were certain to vote in the election, the lowest percentage of any age bracket. 8.47pm update: What are the latest poll predictions? Democrats have 1 in 7 chance or 14.9 percent of winning control. The Republicans have a 23-seat majority in the House, where are all 435 seats are up for re-election. But despite only having a two-seat majority in the Senate, 18 of the 27 that they hold are expected to remain blue. 8.13pm update: What are the key governor races? Voters in 39 states will choose governors this year and more than 80 percent of state legislative seats are up for election. Larry Sabato, director of the Virginia Center for Politics at the University of Virginia, said: “The most important work done in the country in public policy is done in the states by governors and state legislatures. The GOP currently holds 33 governor’s seats, compared to 16 for the Democrats. All US governors serve four-year terms, except those in the states of Vermont and New Hampshire, where the terms span two years. Barack Obama campaigned for Tallahassee Mayor Andrew Gillum at a rally in Miami, Florida on Friday. In his speech, the former president said: “The real reason I came down to Miami is because this Tuesday might be the most important election of our lifetimes. “Politicians will always say that, but this time it’s actually true. The stakes really are that high. The 2018 midterm elections are proving to be a costly affair. In Texas, Democrat Beto O’Rourke and Republican incumbent Ted Cruz have spent a combined $93m on their campaigns ahead of the election. Overall, the Center for Responsive Politics has predicted more than $5 billion will spent on this election. No midterm elections have ever surpassed $4.2 billion. A federal judge has ruled that 3,141 recently naturalised US citizens must be allowed to vote after their voter registration were placed on hold. This is a defeat for Georgia Secretary of State and Republican candidate Brian Kemp. Voting rights activists say many of them are minority voters. In a blog post published on Thursday, November 1, Mitt Romney criticised US President Donald Trump’s rhetoric against the media industry. Barack Obama is expected to speak at a rally in Miami Friday afternoon, local time. And thousands of people have already started to line up to watch the former president’s speech. Obama is campaigning for Andrew Gillum, the Democrat Tallahassee Mayor running for governor. Watch the crowd queueing up to watch Obama. A recent report conducted by Vice News suggests that Facebook’s new regulations for political ads is easily manipulated, allowing users to post ads under fabricated identities. In a joint statement, the two Democrats said: “We appreciate the work that Facebook has done to implement the Honest Ads Act, our legislation to create transparency and accountability measures for paid online political ads,” the two say in a joint statement. On Thursday night, the US President issued a new attack on the 14th Amendment, which guarantees that even children born on US soil to undocumented immigrants are American citizens. And today, Trump vowed tough restrictions on asylum and turned his attention to consolidating GOP power. He even stated US troops could turn their guns on members of the migrant caravan, a group of asylum seekers heading to the US. Secretary of Homeland Security Kirstjen Nielsen has said the department has seen “continued attempts” to access election-related systems. But the few attempts that succeeded in gaining access have not come from foreign countries. Former President Barack Obama will campaign for Tallahassee Mayor Andrew Gillum in Miami on Friday afternoon, local time. Gillum could become Florida’s first African-American governor with a victory next week. And Democrats are hoping Obama’s visit to the Sunshine State can put Gillum over the top in a race he has led narrowly. After the former president’s Miami visit, he will head to Atlanta to meet up with former state House Minority Leader Stacey Abrams. President Trump has made 6,420 false or misleading claims over 649 days, according to an analysis made by the Washington post. According to the analysis the US President made 1,318 false or misleading claims in the first nine months of his presidency. This is an average of five a day. However, in the seven weeks leading up the 2018 midterm elections, Mr Trump made 1,419 false or misleading claims — an average of 30 a day. Polls are showing Republican Senator Ted Cruz holds a three-point lead over his challenger, Democrat Rep. Beto O’Rourke. While still in the lead, this latest poll shows a tightening gap between the candidates. Internal Republican polling indicates that Mr. Cruz is ahead by about eight point, something not reflected in the public polls. This indicates the importance of turnout: if turnout is as high as expected, particularly after the high early voter turnout. Mr Cruz leads Mr O’Rourke 50 percent to 47 percent among likely voters surveyed in the Emerson College poll released on Thursday, with two percent of those surveyed still undecided. The poll of 781 likely voters in Texas was conducted on Oct. 28-30 and has a margin of error of 3.7 percentage points. With only days to go before the 2018 midterm election, political bettors are taking a dimmer view of the prospects of the ‘blue wave’ than certain pundits and sections of the media. The odds suggest the Democrats have a 2 in 3 chance of taking the House, but many are willing to wager against it and in a situation identical to Trump’s win in 2016. The poll was commissioned by Ipsos for The Daily Beast, where respondents were asked what lawmakers’ first priority would be after the vote on November 6. The next popular answer was “fixing problems with our health care system” at 34 percent. 22 states and Washington DC, early voting numbers have surpassed those from the 2014. Voters in states like West Virginia, Oregon and Alabama have abortion rights on the ballot this election. The three US states long support for abortion rights is being tested on November’s ballot by a group of determined activists pushing an initiative to prohibit state funding for most abortions. This comes in the wake of the confirmation of Brett M. Kavanaugh to the Supreme Court and major concerns from abortion-rights supporters that a new conservative consensus on the high court could overturn the landmark 1973 Roe v. Wade decision outlawing restrictions on the procedure before the fetus is viable. The stakes are high for both sides in the highly charged abortion debate. The advert shows Bracamontes, who has been sentenced to death, laughing in court and vowing to kill more officers. The advert then shows migrants pulling on what appears to be a border fence. So far, we know that more women than men have voted and a high percentage is elderly. Former President George H.W. Bush was seen entering a polling station to cast his vote yesterday. Mr Bush was accompanied by his two best friends – Jim Baker and his dog Sully. The former president is one of thousands of Americans voting early ahead of the 2018 midterm elections this year. For the first time in US history, the majority of the Democratic Party’s nominees are not white men. This means traditional safe-seat “insider” Republicans are being pushed to the fringes of Trump’s party. The reason is thought to be voters on both sides want more authentic, less polished and non-establishment candidates. Campaigns such as #metoo, March for Our Lives and Black Lives Matter are expected to have heavily influenced this year’s midterm elections and how Americans vote. The former Secretary of State and two-time presidential candidate admitted she would “like to be president” as she revealed she would think about her political future following the November 6 elections. When asked whether she wanted to run again, Ms Clinton said: “No, No,” before conceding “well I’d like to be president”. Hillary Clinton, 71, then bizarrely appeared to recite her career experience, saying she felt “very well prepared” for the “work” that awaits a new Democratic president in 2020. READ MORE: Could Hillary Clinton run for President again? The talk show superstar Oprah Winfrey has been knocking on doors to get voters behind the Democrat’s nominee for governor of Georgia, Stacey Abrams. Oprah, 64, gave a rousing speech to Democrat supporters ahead of next Tuesday’s vote in which she called Ms Abrams a “changemaker”. Speaking to a mostly female audience north of downtown Atlanta, she said: “I am here today because Stacey Abrams cares about the things that matter. Also rallying behind Ms Abrams is former president Barack Obama and Hollywood names such as Will Ferrel and Mark Ruffalo. 9.30am update: What do the latest polls show? According to polling site FiveThirtyEight, which takes polls from various platforms and combines them to provide the most ‘probabilistic’ estimate, Democrats hold a good chance of taking the House of Representatives. Current polls show the Democrats have an 85.3 percent chance of taking the House. The Senate looks less hopeful for the Democrats, with only a 15.0 percent chance of taking control. READ MORE: What do the midterms decide? The talk show host and stalwart of American television has been using her immense popularity to campaign for the Democrats. Donald Trump’s daughter, Ivanka, made a surprise appearance in Iowa on Thursday night as she joined the campaign trail. Campaigning with Republican Gov. Kim Reynolds, Ivanka spoke to a crowded room at the Reynolds campaign headquarters. Mr Reynolds is locked in a tight contest for Iowa with Democratic challenger Fred Hubbell. READ MORE: Is Donald Trump DOOMED by this key factor? Early voting, which is offered in most states as a means to make voting more convenient and avoid long queues, has seen a record turnout. The 2014 midterms saw 12,938,596 total votes cast with six days before the elections, compared to 24,024,621 total votes cast by Wednesday. These numbers are comparable to presidential elections, proving just how contentious and important these midterms are proving to be. And the race is still wide open: Battleground states like Texas – where progressive candidates like Beto O’Rourke have threatened to unseat Republican incumbents like Ted Cruz – have seen record-level early voter turnout ahead of Election Day. Early voting among young people in key US midterm battleground states has surged dramatically in the run up to the midterms on November 6. Texas and Georgia, traditionally Republican-leaning states, have seen an increase in the early vote rate among 18 to 29-year-olds by nearly five times compared to 2014. In Texas, young voter turnout is currently up 508 per cent. While a national poll by the Institute of Politics at Harvard’s Kennedy School of Government found 40 percent of 18 to 29-year-olds plan to “definitely vote” – double the 2014 figure. And 66 percent of young voters polled said they would vote Democrat.